A fresh encounter with the expansive experiments of poets (and others) who in the 1950s casually formed the New York School. 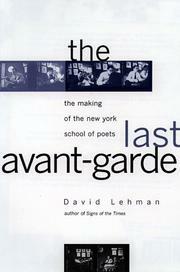 Lehman (Signs of the Times, 1991) both sets the heady urban social scene of this “last avant-garde” and reconsiders the poetry that helped to provoke it and was provoked in turn. Focusing on the “school” ‘s largely antiacademic founders, John Ashbery, Kenneth Koch, Frank O’Hara, and James Schuyler, the author devotes a chapter to each, with two chapters of more general import serving as bookends before and after. Lehman deftly strikes a balance between biographical and literary issues. For instance, in writing of the reticent Ashbery’s effusively enigmatic work, he makes no attempt to simplify the poems or charm readers with comparatively straightforward biographical insights. Instead, the writing rightly assumes primary importance, and his comments on the life settle in around it. Lehman approaches Koch as a neglected master whose puckishly inventive humor, indefatigable teaching, and dedication to artistic collaboration have been central to inspiring camaraderie within the New York School. Yet not everyone will be convinced that Koch’s writing merits unquenchable hosannas. And in Lehman’s argument that the school may represent the “last” avant-garde to matter, he venerates with questionable nostalgia a series of literary improvisations happily not yet concluded. For readers outside the action to fully appreciate why these poets and their colleagues contested expectations, more chronicling of the opposition to them would have been useful. An inherent irony of this cultural history: it’s an intelligent, spirited encomium written to salute a movement that once seemed not to want any; the poets served the margins. But Lehman clearly wishes to remind our commercial age of the need for robust individualism to give backtalk, although he seems not to hold out much hope for any to emerge of true new pungence. By contrast, New York of the 1950s is unveiled as a contrarian mecca. A valentine for four poets—and a cultural corrective.